A regional publisher has announded it is selling the building which has been its headquarters for almost 50 years with a view to finding new premises nearby. Journalists and sales staff at the Archant-owned Eastern Daily Press and Norwich Evening News have been based at Prospect House, Norwich, since the late 1960s. Chief executive Jeff Henry emailed staff last week to say the company was now on the lookout for new premises – although it hopes to stay in Norwich city centre. 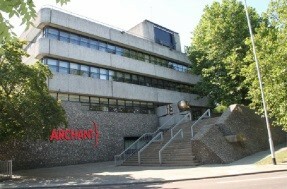 The email, which has been seen by HTFP, reads: “Archant has been proud to have its headquarters at Prospect House in Norwich for almost fifty years. Until the opening of the Thorpe Print Centre in 1996 our papers were printed on site and just over 500 of our employees are now based at this building. “The building though is starting to show its age and has become too big for our current needs. Maintenance costs are increasing and the heating, air conditioning and windows all need replaced. The last major refurbishment was carried out ten years ago at which time we expected to be able to extend the building’s useful life for seven years. “We are today announcing the start of a review process to consider our future space needs in Norwich. This is the start of a business planning process which we expect to lead us to a recommendation some time in late spring 2018. “The Company has a strong preference to remain in the centre of Norwich. “We are keen to engage with all our people on our future needs. So, in the next few weeks a number of work streams will be set up to help us determine what we think our space requirements will need to be over the next ten years. This will include representatives from all parts of the business. “We will also look at areas such as provision of catering services, IT infrastructure and future use of technology, car parking, meeting rooms, cycle storage and showers amongst many. Archant has so far not responded to requests for further comment on the proposed move. Go back in time a few years and it’s almost like Archant bosses could have been faced with this choice: New heating, air conditioning and windows… or Mustard TV? The way this email was written it’s like the decision has already been made. Archant has already sold premises in Ilford and Ipswich, and the Prospect House site must be worth a fortune – it’s the last big area in central Norwich which will ever come up for redevelopment. Besides, over the course of the next 10 years, printed newspapers are going to go – we all know that – so that will affect potential space needs for the company. So farewell Rouen Road. Great place to work in the 80s when sale of the EDP nudged 100,000 (not a typo!). So. Farewell then to the mighty Prospect House. For 50 years you towered over the city centre alongside the castle across the way. You were under siege since the print works moved off site. And you made a valiant effort to withstand assaults from numerous predators – but capitulation was inevitable. Now, the spirit of local papers at the heart of the community – the original social media – dies with you. Can’t say this is unexpected. More than 15 years ago, there was a mysterious planning application to build a multi-plex cinema on the site. The bosses denied all knowledge of it and described it as “speculative”. However, many of us working there at the time were fully expecting to move out to the printing plant site at Thorpe St Andrew. The fact that the company is looking to remain in the city centre is a positive. Been in the cards for sometime and is the direct result of the crippling losses from the past few years including Mustard tv but the answer is simple, make ad reps remote workers like many other large sales operations,put branch office reporters back into the community via shared offices and move the rest to the east Norwich print centre where’s there’s plenty of room.